To see the text and photos in a larger size or smaller size, hold down the Ctrl button with the left hand and use your right hand to move your cursor forwards or backwards to increase or decrease the size of the print and photographs or click on any photograph and it will enlarge to a larger screen size. It will be clearer in detail than the photo on the post. 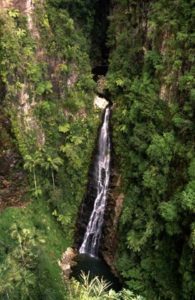 It will be as if you were really there looking at the scene …..
Minyon Falls lookout offers stunning views of the waterfall, rainforest and coast, with opportunities for picnics and barbecues. The lookout is wheelchair accessible. The view from Minyon Falls lookout is simply stunning; not only of the falls themselves, but on a clear day you might be lucky to see all the way out to the coast. 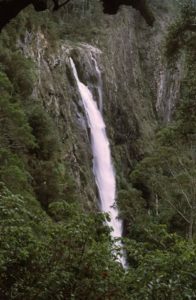 From the lookout, watch as the flow cascades over Minyon Falls to a deep palm-shaded gorge roughly 100m below. The tops of the cliffs are forested with Australian eucalypts, like blackbutt and scribbly gum and at the base is a beautiful natural pool that was made for swimming. Minyon Falls is a great place for a quick stop, but if you’d like to spend longer at this pretty place, there’s a picnic area with plenty of shady trees, barbecues and picnic tables. 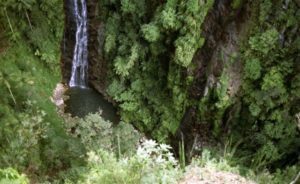 There are also a couple of bushwalks that leave from the picnic area, including Boggy Creek walk, which takes you to Rummery Park campground, and Minyon Falls loop walk, which takes you down to the base of the falls. Minyon Falls Creek …. edged with ferns and surrounding rainforest trees …..
Green moss on a fallen log and on a stump left behind when the tree was cut down years ago …. A carpet of moss on the ground …. Harriet Aitken among the ferns …..
Ken Aitken …. a leader through Minyon Fall Forest …. Ken and Harriet Aitken by the creek …. Minyon Falls Creek …. Ken Aitken looking thoughtful …. 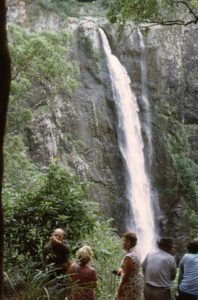 People by the Minyon Fall Waterfall …..
Minyon Fall Waterfall ….. a very long waterfall way down to the pool at the bottom ……. There is a whole path with steps where you can walk down and come back to go for a swim in the waterfall pool in summer weather …..